In Duck Hunt, players utilize the Nintendo Zapper Light Gun that must be plugged into their NES consoles, and attempt to shoot down either ducks or clay pigeons in mid-flight. 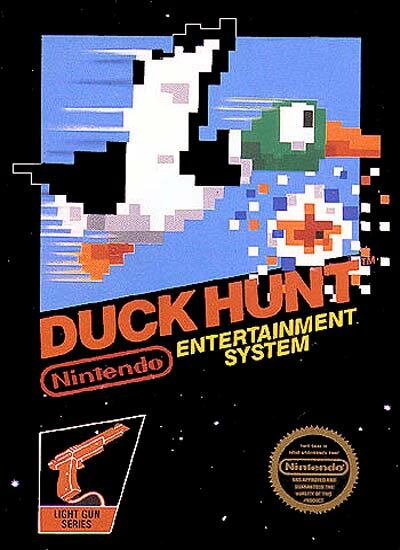 Duck Hunt was also released as an arcade game in 1984, and is included in the PlayChoice-10 arcade console. The game has three modes: one and two-duck variations on the above formula, and a third mode called "clay pigeon shooting". The clay pigeons are much smaller sprites than the ducks, and, in later rounds, require faster reaction time to shoot down than in comparably numbered duck modes. In Vs. Duck Hunt, Clay Shooting mode appears as the second round with the first round being the two duck variation (the arcade version never had one duck). Also, in the arcade version of Duck Hunt, the dog appears in the clay shooting round when players miss the clay pigeons. In the NES version, the dog only appears in the duck shooting modes.